Erik has written several academic publications and four books. Bang For The Buck, that presents Erik’s model the Influence Matrix which explains and measures the effectiveness of marketing communications, Kontroll, that explains the elements of effective communication, Värdet av Konst, which describes the value of art for individuals, organizations and communities and the doctoral dissertation Understanding Advertising Creativity. Bang For The Buck (June 2017, Swedish) uses the so called Influence Matrix to explain the elements of effective marketing communication. The English edition is coming soon. Many argue that the age of old media is over and digital channels are the future. Is that true? The answer can be found in the understanding of which marketing investments are the most effective. The question is how we compare sales with brand building without comparing apples and pears. In Bang for the buck, the reader gets guidance in what will always be common to all channels – the customer’s brain. Measurement values can first be compared and give us insights about what each brand should focus on when they form a whole. In his book, Erik Modig presents his model, The Influence Matrix, which is a tool for management, communication, marketing and sales departments so that they can link and optimize daily work. The war between how we explain and measure the effectiveness of marketing has just begun. Bang for the buck and The Influence Matrix offer a tool for understanding, utilizing and winning this war. Bang For The Buck will be released in English in summer 2018. 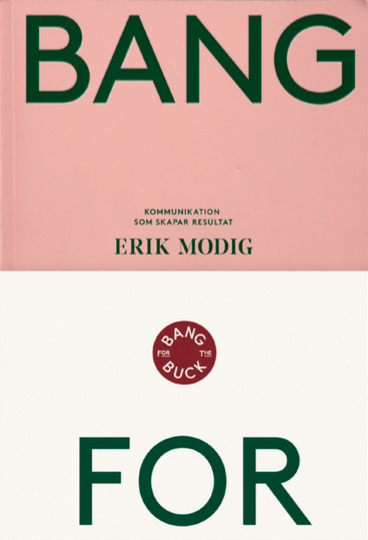 In 2017 Erik received the prestigious award Marketing Book of the Year (Årets Marknadsföringsbok) designated by the Swedish Marketing Association (Sveriges Marknadsförbund) for his book Bang for the Buck. Watch the video below for some quick facts about Bang for the Buck! 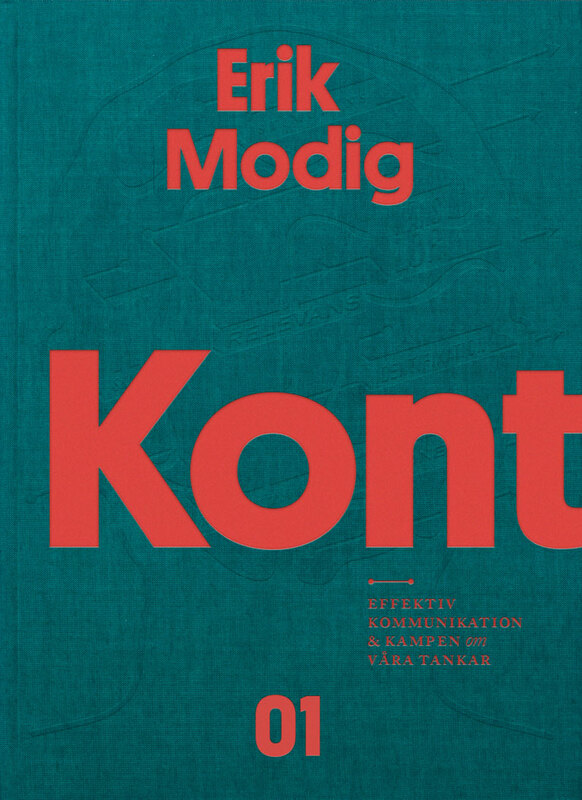 Kontroll – Effektiv kommunikation och kampen om våra tankar (March 2015) explains the elements of effective marketing communication. The English edition is coming soon. The era of Communication is here. Kontroll takes you on a journey to the world’s top communicators and their recipes for effective communication. Based on brain research, you gain knowledge about how effective communication can control behavior, attitudes, sales, brands, likes, shares – and the fight for your neighbor’s thoughts. Kontroll is for those who want to be able to create and evaluate effective communication as well as understand the underlying mechanisms of how communication can spread and have an impact. Kontroll rapidly climbed the ladder on Bokus’ bestseller list and reached place no. 2 in a short period of time in the category encyclopedias. 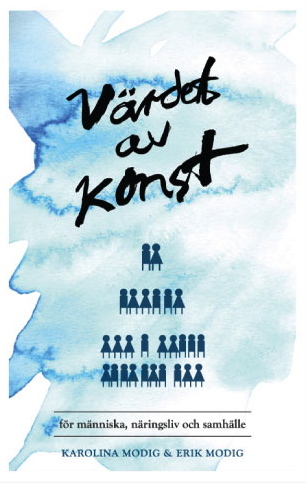 Written together with journalist Karolina Modig, Värdet av Konst (September 2013), describes both the fundamental, social and cognitive value art has for individuals, companies and society. The English edition is coming soon. Värdet av Konst shows how art can make you think differently, and how companies and society can use art for development. After one week Värdet av Konst reached place no. 6 on Bokus’ bestseller list for cultural books. The book is aimed at artists, politicians, companies, gallery owners, art investors, advertisers, museum directors and last but not least, art lovers. It is simply suited for everyone who wants to understand and enhance the value of art in his or her life and in the environment. Värdet av Konst teaches you how to use the value that art has today and will have in the future. In November 2012 Erik published his doctoral dissertation at Stockholm School of Economics. The presented research documents how advertising creativity works and how it can be used to boost advertising effectiveness. Today advertisers face the challenge of securing advertising effectiveness by producing advertisement that gets the consumers’ attention and shape their attitudes and behavior. One suggested way to reach these objectives is creativity. Both advertising industry professionals, awards, effectiveness reports and research support this notion that what makes advertising effective is creative excellence. However, research has shown that advertising professionals seem to have little formalized understanding about how advertising creativity works and how it is defined and measured. Current research needs to better understand the response to creative advertisements by documenting how advertising professionals and consumers assess and value creativity. By applying new perspectives and new theories this thesis investigates the effects advertising creativity has on consumers. 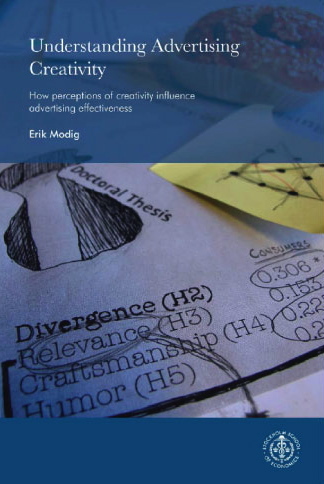 The thesis reviews the academic research on advertising creativity and contributes with five articles to increase the understanding of advertising creativity and how perceptions of creativity influence advertising effectiveness. In so doing, it plays a part in advertisers. Rheologica is a newly formed publishing company, which publishes easy to understand, concise and well-packaged management literature. The company’s ambition is to enable academic knowledge to flow through an innovative publishing process. We offer a completely transparent publishing process that eliminates lead times and inflexible distribution capabilities. 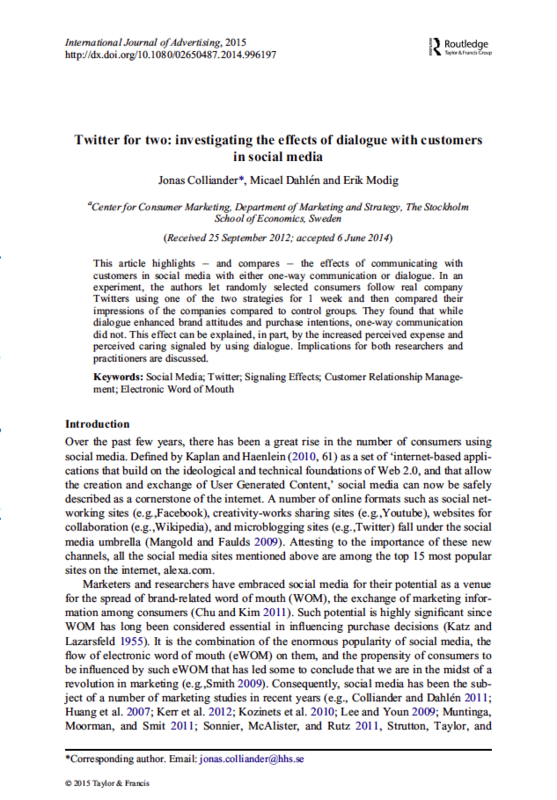 This article highlights - and compares – the effects of communicating with customers in social media with either one-way communication or dialogue. In an experiment, the authors let randomly selected consumers follow real company Twitters using one of the two strategies for 1 week and then compared their impressions of the companies compared to control groups. They found that while dialogue enhanced brand attitudes and purchase intentions, one-way communication did not. This effect can be explained, in part, by the increased perceived expense and perceived caring signaled by using dialogue. Implications for both researchers and practitioners are discussed. Ambient communication, in which nontraditional media are creatively employed to implicitly communicate a target message, is increasingly popular. Advertising on eggs, elevator panels, and public fountains are all real-life examples of this. In the present study we investigate the value of ambient communication from a consumer perspective. 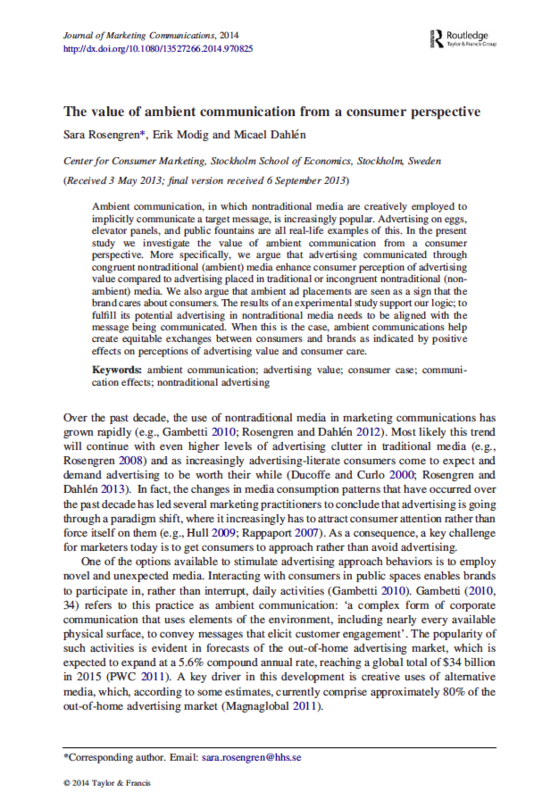 More specifically, we argue that advertising communicated through congruent nontraditional (ambient) media enhance consumer perception of advertising value compared to advertising placed in traditional or incongruent nontraditional (non- ambient) media. We also argue that ambient ad placements are seen as a sign that the brand cares about consumers. The results of an experimental study support our logic; to fulfill its potential advertising in nontraditional media needs to be aligned with the message being communicated. When this is the case, ambient communications help create equitable exchanges between consumers and brands as indicated by positive effects on perceptions of advertising value and consumer care. Can advertising creativity affect product perceptions and retailer evaluations? 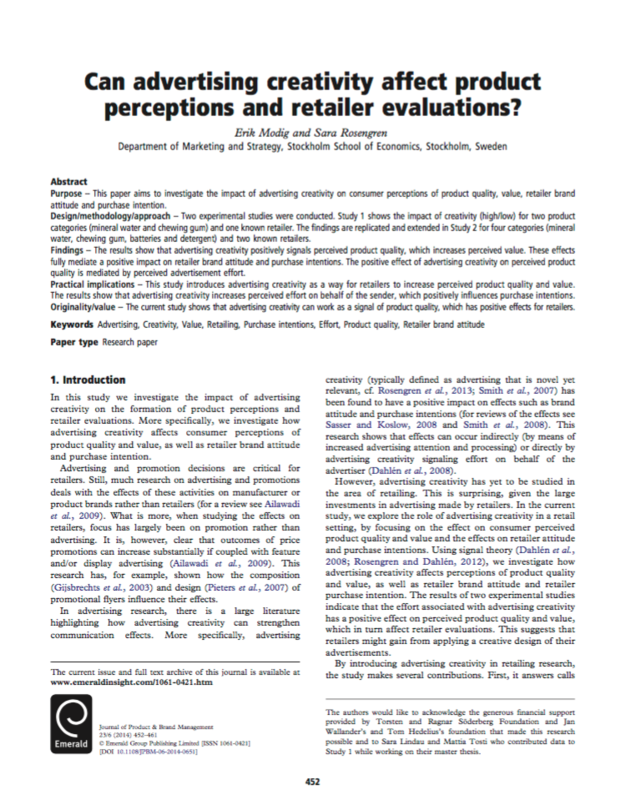 This paper aims to investigate the impact of advertising creativity on consumer perceptions of product quality, value, retailer brand attitude and purchase intention. Two experimental studies were conducted. Study 1 shows the impact of creativity (high/low) for two product categories (mineral water and chewing gum) and one known retailer. The findings are replicated and extended in Study 2 for four categories (mineral water, chewing gum, batteries and detergent) and two known retailers. The results show that advertising creativity positively signals perceived product quality, which increases perceived value. These effects fully mediate a positive impact on retailer brand attitude and purchase intentions. The positive effect of advertising creativity on perceived product quality is mediated by perceived advertisement effort. This study introduces advertising creativity as a way for retailers to increase perceived product quality and value. The results show that advertising creativity increases perceived effort on behalf of the sender, which positively influences purchase intentions. The current study shows that advertising creativity can work as a signal of product quality, which has positive effects for retailers. 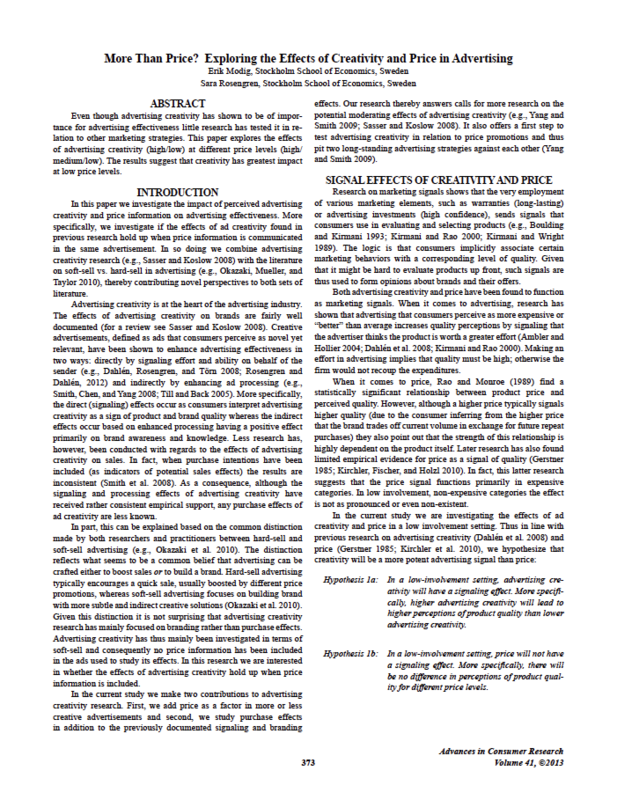 The paper investigates the effects that consumer-perceived sender expense and effort might have on brand perceptions. More specifically, it extends the marketing signal literature to advertising by including both sender expense and effort, and by including both positive and negative effects. A quantitative analysis of 4,000 consumers’ perceptions of creativity award winning, effectiveness award winning and non-award winning advertisements finds that advertisements with higher-than-average perceived expense and effort have positive impacts on brand attitudes, brand interest and word-of-mouth (WOM), while advertisements with lower-than-average perceived expense have corresponding negative impacts. Even though advertising creativity has shown to be of importance for advertising effectiveness little research has tested it in relation to other marketing strategies. 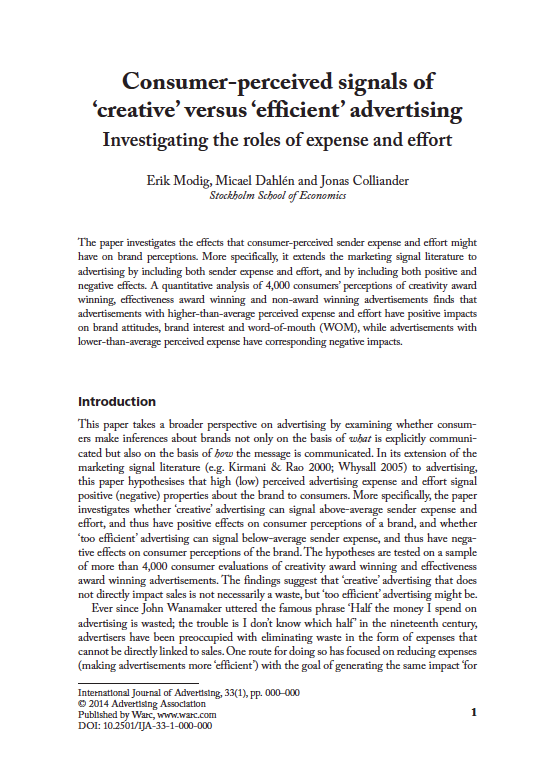 This paper explores the effects of advertising creativity (high/low) at different price levels (high/ medium/low). The results suggest that creativity has greatest impact at low price levels. Think Outside the Ad: Can Advertising Creativity Benefit More Than the Advertiser? 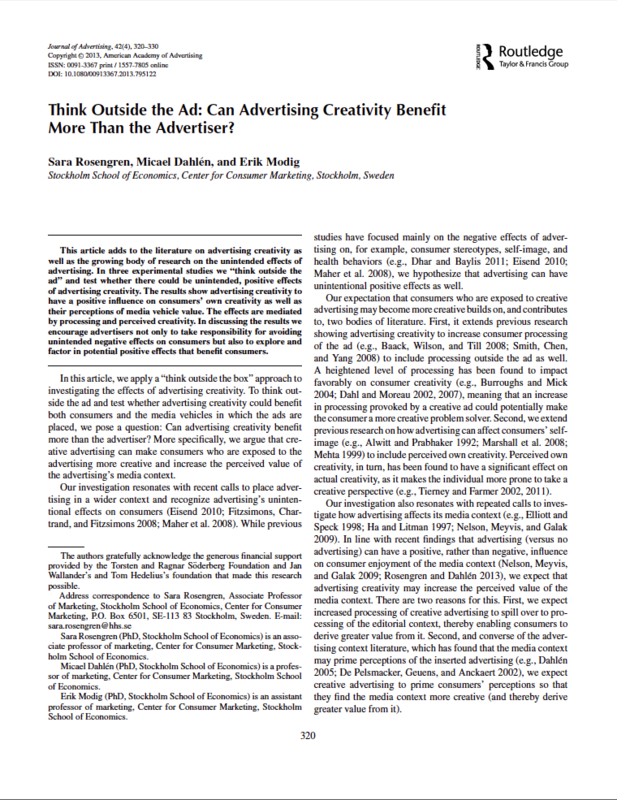 This article adds to the literature on advertising creativity as well as the growing body of research on the unintended effects of advertising. In three experimental studies we “think outside the ad” and test whether there could be unintended, positive effects of advertising creativity. The results show advertising creativity to have a positive influence on consumers’ own creativity as well as their perceptions of media vehicle value. The effects are mediated by processing and perceived creativity. In discussing the results we encourage advertisers not only to take responsibility for avoiding unintended negative effects on consumers but also to explore and factor in potential positive effects that benefit consumers.